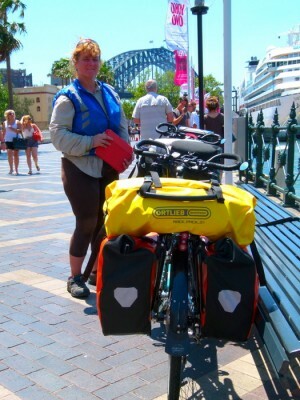 Not before time, we finally got to send almost 8 kgs of our winter gear on to Brisbane, so with fresh legs, a tail wind and a big load off, the hills on the way to Ulladulla didn’t seem nearly as hard as those before Bateman’s Bay. Still 55km took us just over 3 hours and we were glad to pull into the caravan park before the rain really started. The lady at the Ulladulla Headland Tourist Parkwas extremely nice and gave us a lovely site right near the amenities and the camp kitchen. 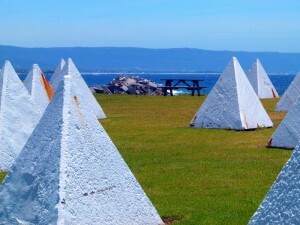 It’s an older park but is situated on a headland overlooking the harbour. It would have looked great if the sun was shining. Hungry tummies ruled and we headed into town to find lunch. The local pub had bangers and mash for $5. There’s not much you can get for $5 in Australia these days so we took advantage of the bargain and had a cleansing ale to boot. 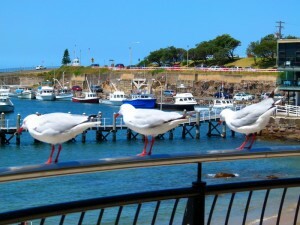 Ulladulla is typical of some of the coastal towns we’d seen along the way. There are big hills in all directions of the main road and the usual shops, clubs, pubs, cafes and harbour. The weather was pretty wild and windy so we took cover in the local bowls club for the afternoon before grabbing some supplies for dinner and breakfast and heading back to hunker down in the camp kitchen. 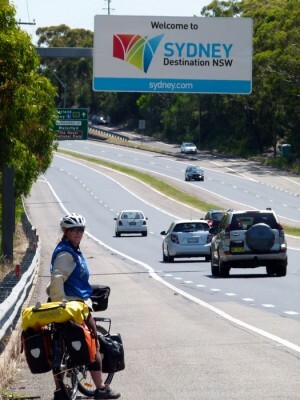 The 70km ride to Nowra the next day appeared to be 50km up and then down for the last 20. The hills were pretty challenging but for today at least, with the assistance of a tail wind, I didn’t have to walk any. The road into Nowra was extremely busy. We rolled into information to inquire about the tourist road on the coast and observed that the caravan park across the road seemed to be pretty damn shabby. A few stray comments from the lady in information confirmed that we may not have any belongings left if we camped up there and left things unattended. The other option, Shoalhaven Holiday Park, was a bit further off the main drag but fitted the bill. We pitched up in the “playground” area before heading back into town to pick up supplies. I’m sure Nowra has it’s highlights but I wasn’t seeing any of them in our short visit there. It looked and felt a bit drab. 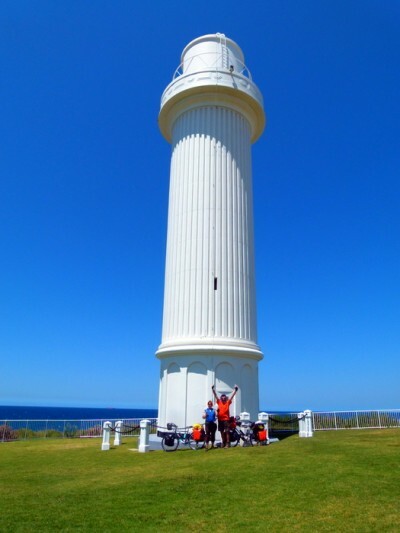 I couldn’t understand why the Garmin wouldn’t let us cycle the whole way into Kiama. I could plot to Gerringong but after that it went haywire. The ride on the whole was pretty flat with only one big hill heading into to Gerroa. The road itself was through the forest and had varying degrees of shoulder from very nice to zilch. Add to that a heap of traffic and I’d have to say we’ve had better days. We stopped for a break just before Gerroa and quizzed a trucky about the best way into Kiama. His whole view on it was we should put the bikes on the back of his truck and he would give us a lift. Apparently road works at Gerringong were going to make our lives extremely difficult. Aaaah. So that’s why the Garmin wouldn’t let us ride on the road. We politely refused his offer but assured him we would catch the train if it looked too dangerous. To cut a long story short…we caught the train. Roadworks had reduced the very, very busy Pacific Highway down to two lanes with no shoulder and very big concrete barriers…Tim calls them “Splat Barriers” cause that’s what would happen to us if we got caught between one of them and a truck. There is no way we wanted to play in that, especially as we could see a very big long hill to complicate matters. Can you imagine how agro, already irritated drivers would be if they had to follow us up that. The train took less than 15minutes to shunt us through to Kiama and we were camped up at the Surf Beach Holiday Park within the hour. We felt a little bit cheated but at least we were alive. The campground was excellent, well positioned and had a very comfortable camp kitchen, TV and pool area. Kiama itself is very nice. 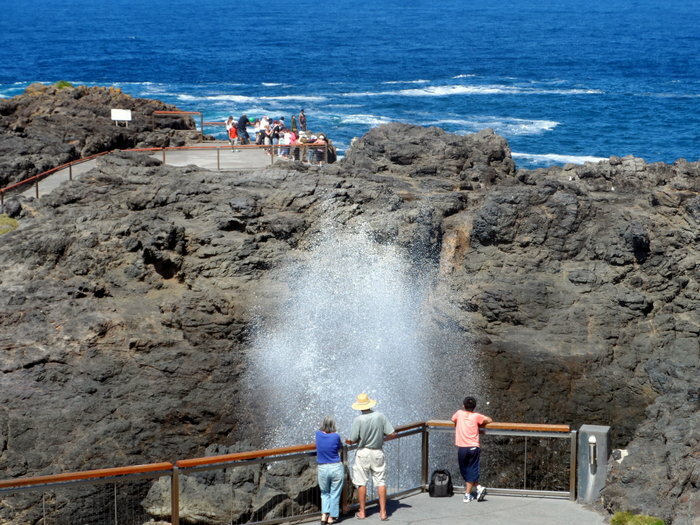 There’s great views over a couple of beaches, a lovely lighthouse and the very popular “blowhole” to ooh and aaah over. The historic buildings are well preserved and the vibe is pretty lively. The only frustrating thing about the visit was trying to work out the best way to ride out of town. It’s amazing how little notice car drivers take of their surrounds. The bike riding information dude wasn’t much help either. By the end of the day we had about 5 versions of where to go. No one seemed to know if the highway had a shoulder, if bike paths joined up and there were even denials there was a bridge over a very obvious waterway on the map??? How the hell they thought they got from one side to another had us beat. Our last resort (and to be fair it should have been the first option) was to drop into the local bike shop on the way out of town. They were extremely helpful and directed us up a bike path that eventually found it’s way onto the highway which had an excellent shoulder/bike lane. 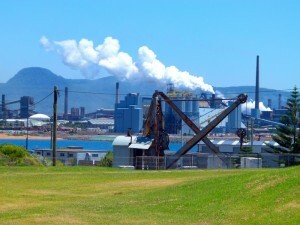 This took us all the way into Port Kembla where we took the “milk run” cycle path out and around the steel works before dropping us right at the lighthouse at Flagstaff Hill. The weather was gorgeous, it was a relief to be out of the traffic, the views were awesome and we had made our 6000th km. We lunched on the water before following another bike path all the way to Bulli Beach where we pulled up stumps for the night at the Tourist Park. Our total ride on the bike paths was 56km but all pretty flat. It’s a good 15km longer than straight up the highway but so much more pleasant. This was quite a nice park BUT it was the weekend and this had attracted quite a few Bogans who felt it was their god given right to stay up to 3am and keep the rest of the park awake with their boorish conversations held at the top of their lungs, with a seemingly impossible amount of expletives thrown in for good measure. I feel so proud to be Australian sometimes…NOT! It’s also a long way to walk into town up and down several hills to get to the main drag. Luckily it has a pretty good café right out the front that does a reasonable range of meals and pretty damn good coffee. The weather was pretty good for our last leg into Sydney. Once again, opinions varied widely as to the best way to get there. We knew at the very least we would have some pretty big hills to get over. 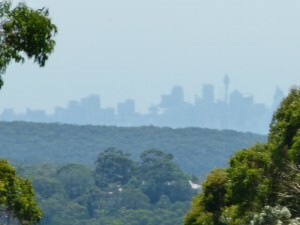 The bike path heads north of Bulli for another few kms before it empties you out on Lawrence Hargrave Drive. The shoulder is OK in places but non-existent in others. There were plenty of other bikes on the road so at least motorists were being a little bit careful. We stopped and talked to a few of the guys to see if we could get any more clarity on the best way to ride. The only real thing they were all clear on was that we should only ride as far as Waterfall and then get on a train. That certainly wasn’t the way we’d planned it but everyone was telling us we were mad to ride any further. 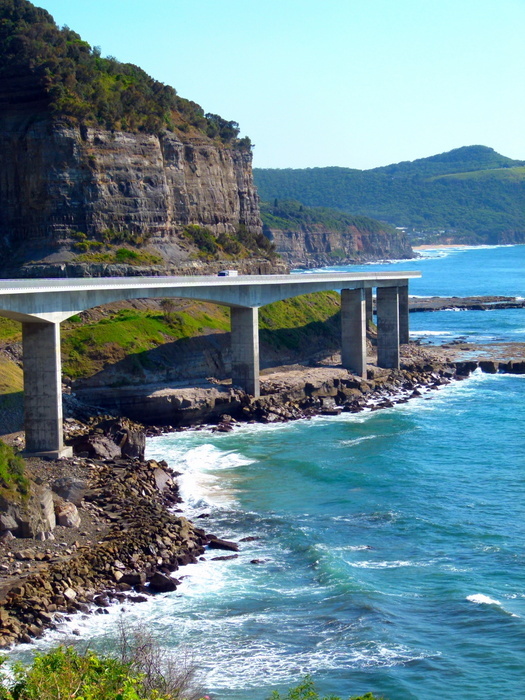 In the end we rode through to Stanwell Park via the Sea Cliff Bridge, a 2km stretch of the highway that comes out over the water and away from the cliffs with awesome views of the coastline. That was pretty cool. We stopped to rest the legs for a little while before heading straight up Bald Hill to Stanwell Tops. Around 2kms of pretty steep up with no shoulder, a dangerous gutter on the side in places and plenty of traffic. At points I just had to get off and push. I’m pretty sure I could have ridden it all with a clear run but there was no room for error or the wobbles as I hit my lowest gear. Once again it would have been a pretty spectacular ride but conditions didn’t lend themselves to much looking around. At the top of the hill we had a choice. Go right and head through the national park, with a couple of different options OR turn left and head towards the old Pacific Highway. We stopped another cyclist who advised us to turn left. OK, so we turned left and around 6 km later were out on the old pacific highway. There was still a fair amount of traffic but the road conditions were pretty good. We motored along to the Waterfall turn off and promptly stopped dead. It was a VEEEERRY steep hill up to the station which we had to walk and a 30 minute wait for the train. We’d only cycled 35km today but it was a 3 hour ride time with an average just over 11kmph. It was hot and windy and we’d had enough. Everyone had said take the train so we would. There were no special carriages for bikes so we simply blocked the centre aisle all the way to Martin Place. It was frustrating, and even a little bit hilarious to watch some people’s stupidity while trying to negotiate us. We tried to be as polite as possible but held our ground as well as they seemed to think that we could magic the bikes out of their way. It was a downhill run to Circular Quay to catch the Manly Ferry to visit family. The place was absolutely heaving with locals and tourists alike and wheeling fully laden bikes through the throng was character building. 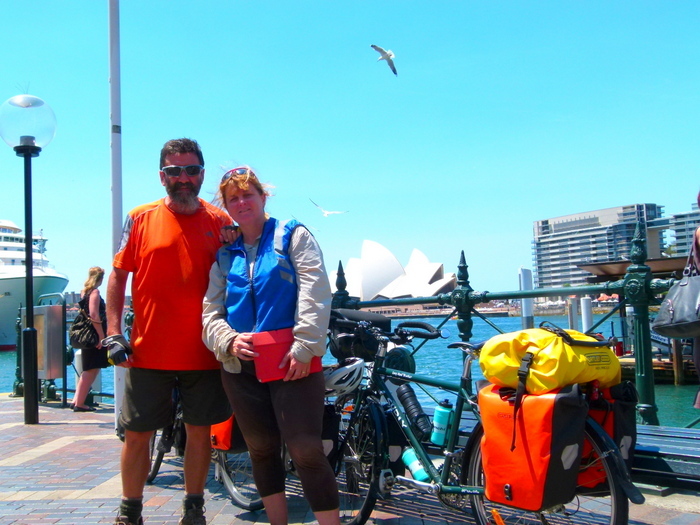 Of course we had to stop and take some happy snaps with the Opera House, Sydney Harbor and “The Coathanger” in the background and were feeling pretty damn chuffed with ourselves. For many others this would have been the end of their journey. We still had another 1000km or so to go but at this stage were pretty damn confident we were going to make it all the way. Rumour has it the hills are much smaller on the way north. We can only hope so.